Are you giving up hopes of meeting your Twin Flame? Perhaps you have lost faith that a Twin Flame actually exists, even though so many couples prove it otherwise. Can we suggest something: don’t give up just yet. Keeping your faith a little longer is worth it. However, if you are not ready to meet your Twin Flame you won’t change anything just by having faith. You need to take action. What prevents you from meeting your Twin Flame is you, your mindset and habits. 1. You have not aligned your energies correctly. Once you give out energy, it will find its way back to you. When your energy isn’t aligned with what you desire, chances are you would never get what you want. Feeling that you are far away from your Twin Flame or that you won’t meet them will automatically yield such result. By emitting such vibration, you are holding yourself back. Correct this by emitting vibrations that resonate with your desires. Make sure they are full of love and happiness if you want to receive love and happiness. In order to attract your Twin Flame into your life you first have to vibrate as if you are already together. 2. You are not open to receive love. The first step is always giving. You need to give love and happiness in order to receive love and happiness. But even if you emit such loving and positive vibrations you might be closed to receiving love back. This might happen for a couple of reasons. Deep down you might feel like you do not deserve love for example. Or you might even be scared of being vulnerable enough to receive. Whatever the case you are not in alignment with the energy that you are emitting. You need to recalibrate yourself in harmony with the positive energy that you are emitting and open yourself to receive it. 3. You are not being yourself. Most people think that they first need to achieve something in order to be who they really are. But this is absurd. You are already you. You don’t need to prove anything to anyone to be allowed to be you. When you step back from this race of approval, you realize that you’ve been doing so many things you do not really like just so others will give you validation. When you start living like you desire, not like you think that others think you want to, you become yourself. You start shining your true light. 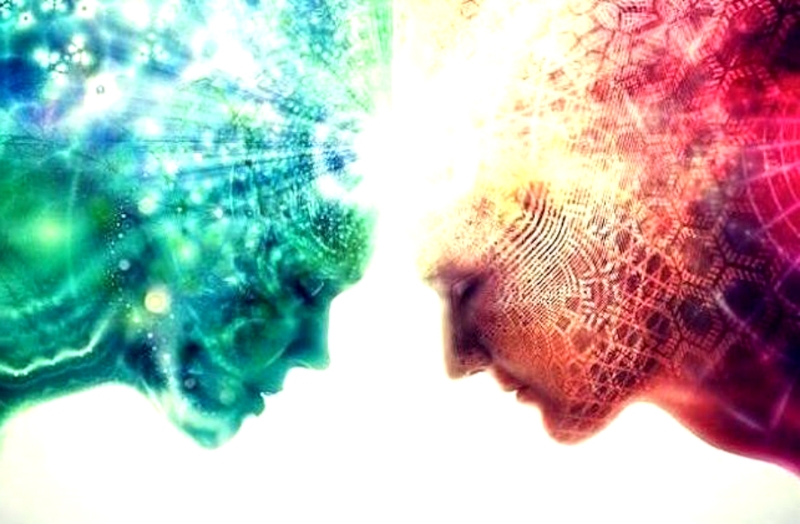 By being yourself you are emitting your unique vibration to the world, and this vibration is exactly what your Twin Flame is attracted to. 4. You are delaying it. The truth is that happiness is not something that is to happen in the future. If you think this way, you’re not fully present to the moment. You always delay happiness and do not experience it fully. You might be doing the same thing to your Twin Flame. If you think meeting your Twin Flame is something that will happen in the future you are not really boarding that train. Your Twin Flame is out there, existing at this moment right now. Just because you haven’t physically met them it doesn’t mean that you are not affected by their energy and choices, just like we are all affected by everyone else. Meeting your Twin Flame happens every moment. It’s a dance of 2 energies that gravitate towards each other. By living like your Twin Flame is something that will happen in the future, you are not dancing that dance. 5. You are busy connecting with other people. Obviously, you are surrounded by a number of people: family, friends, workmates or casual acquaintances. While you interact with these people on a social level, you also interact with them on an energetic level. Sometimes your energy might be depleted by being surrounded with people who drain you. Spending too much time with toxic people drains your energy and this decreases your vibratory intensity. Instead of directing your energies to your Twin Flame, you might be busy directing them to other people. This spoils the process of connection between you and your Twin Flame. Create healthy boundaries and feel free to reject spending time with people who are toxic. 6. You do not take care of your energy. A Twin Flame relationship first starts with the energy relationship you have with yourself. By not taking care of your energy you are not establishing a healthy relationship. This reflects upon the relationships you have with other people and the world around you. Your Twin Flame will not be attracted to such energy, or might not even recognize you energetically. By taking control of your energy and directing it towards things that you like and fill you up with more energy, you are creating a healthy relationship with yourself. This way you are open to create healthy relationships with others. 7. You need to learn an important life lessons first. Your Twin Flame is not a person who has the purpose of making you whole. Making yourself whole is your own business. This means that you might have to learn an important life lessons first, in order to meet them. There might be parts of you that need healing, or parts of you that you yet need to discover. Whatever the case, keep trying to be the wholest version of yourself. Your Twin Flame will come when you are ready. You might never know when you will meet them. Whether in the next month or week or day, you might eventually bump into your Twin Flame. As long as you take care of your energy and vibration, you are sure to meet the one you have been waiting for. While we could not deny the fact that there is always a right time for the right things to fall into place, doing the right things might make the equation a bit easier.